VF Quest Revealed: What You Expect? First ever screens and details for Virtua Fighter: Cyber Generation on PS2 and GameCube - plus, the December 12th mystery explained (there's still something else on its way). Take a look at these first images of an officially, newly unveiled Sega AM2 game. It's called Virtua Fighter: Cyber Generation, the game previously known as the mythical Virtua Fighter Quest. But these screenshots might not be exactly what you were expecting. Where are the familiar faces of the Virtua Fighter series? Who are these two characters? 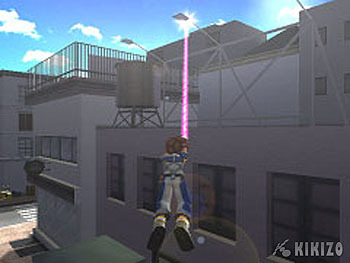 Here we endeavour to explain what we know so far about VFCG, which is coming to PlayStation 2 and GameCube Summer 2004 in Japan. In a not-so distant future, the human way of life is becoming more and more sophisticated and convenient, but could it all be about to take a turn for the worse? This doomsday setting is how the game's story opens. The man-made, floating city of Acopolis used to be an industrial island, but over time has become more and more residential, with houses and schools. As the civilisation grew and expanded, and as technology advanced, the community couldn't take the pace of the real world, so 'Nexus' was created. Most of every day life now continues to take place in the digital, virtual reality world of Nexus, just like The Matrix. But the servers that run Nexus crash one day, for reasons unknown, leaving the digital world in turmoil. 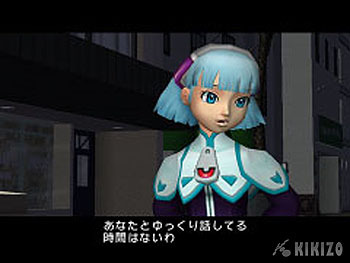 The first of the two main characters is fourteen year-old Sei, pictured here. The RPG adventure game will unfold as Sei plays through the digital cyber world, in an attempt to restore normality with data from the real world. People like Sei are known as treasure hunters - sort of like advanced hackers. Sei will encounter what the story describes as Judgement Six - which all Virtua Fighter fans will know is the evil J6 syndicate organisation from the VF storyline that created Dural. The Syndicate consists of six managers - Judgement, The Devil, Wheel of Fortune, The Moon, The Tower and Death. These will again sound familiar to VF die-hards. 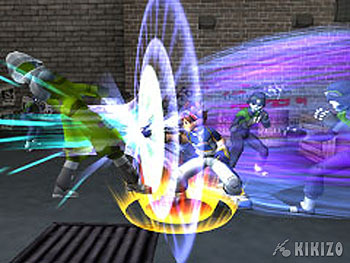 The official documentation suggests that you will be able to use your Virtua Fighting experience, and techniques you have mastered, in Cyber Generations, although it is unclear whether this means data from the memory card with a VF4 game save, or more generally just VF techniques being included in the battle system. 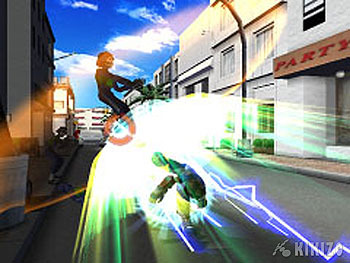 We suspect the latter since no VF fighting game has ever appeared on GameCube - and VFCG is coming to both Cube and PS2. The second main character is fifteen year-old Touka, who we think is Sei's sister. Apparently the two used to fight as siblings and Touka has a chip on her soldier because their father (who's still around now) always took Sei's side. We might be completely wrong on this bit. But either way it doesn't explain much about Touka's role in the game. 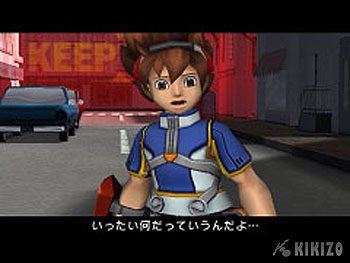 Unfortunately it seems that the cast of the VF series is nowhere to be seen, although an Akira-looking character is seen from behind in one of the screenshots. 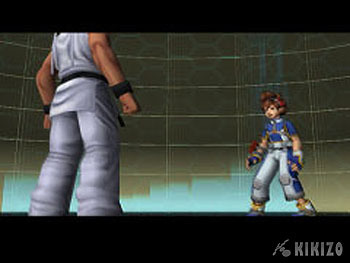 It would appear that the connection between Cyber Generation and the Virtua Fighter series, other than parts of the J6 storyline and some of the fighting engine, might be very loose indeed. Meanwhile, it has been brought to our attention by Sega that the whole December 12 thing reported last week was not entirely on the money. December 12 will see a shiny new Sega unveiling (possibly still in Dorimaga as expected), this time for an network arcade AM2 title known as Quest of D.
We hope to learn more in the near future. Stay tuned.